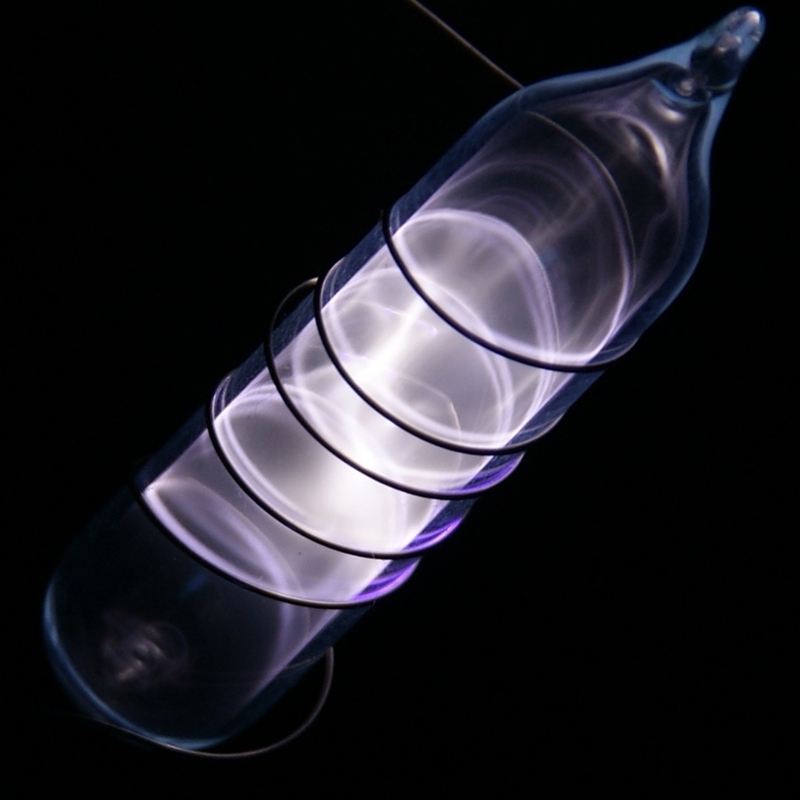 Under normal conditions krypton is colourless, odourless, fairly expensive gas. Solid krypton is a white crystalline substance. 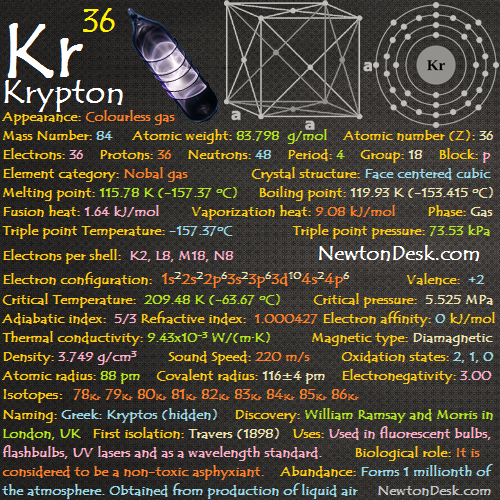 Krypton is a “noble” gas, and it is characterised by its brilliant green and orange spectral lines. The spectral lines of krypton are easily produced and some are very sharp. This compound decomposes when heating to room temperature. Other halogens doesn’t react with krypton . Krypton clathrates (cage compounds) are prepared using hydroquinone (C6H6O2) and phenol (Phenolic acid, C6H5OH). AKrypton is used commercially as a filling gas (filled with a mixture of krypton and argon) for energy-saving fluorescent lights. It is also used in some flash lamps (photographic projection lamps) used for high-speed photography, in very high-powered electric arc lights used at airports, and in some stroboscopic-lamps, because it has an extremely fast respons to an electric current. It is reactive enough to form some chemical compounds, Like krypton reacts with fluorine to form krypton fluoride, which is used in some lasers. 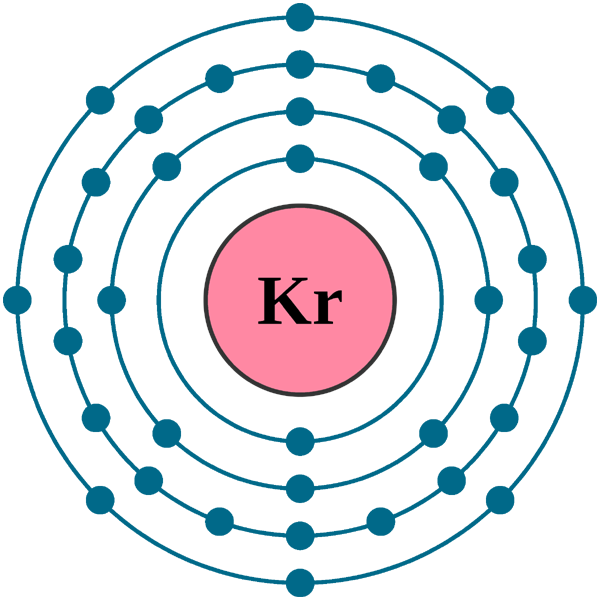 A mixture of stable and unstable isotopes of krypton is produced by slow neutron fission of uranium in nuclear reactors as Kripton-85 (most stable isotope). It is used to detect leaks in sealed containers, to excite phosphors in light sources with no external source of energy, and in medicine to detect abnormal heart openings. 85Kr can be used for chemical analysis by imbedding the isotope in various solids, During this process, kryptonates are formed. 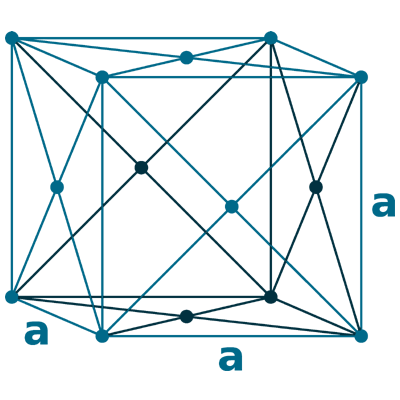 Kryptonate activity is sensitive to chemical reactions at the solution surface. The metastable isotope krypton-81m is used in nuclear medicine for lung ventilation/perfusion scans. 83Kr has application in magnetic resonance imaging (MRI) for imaging airways. The isotope 86Kr was used to define the standard measure of length, where 1 metre was defined as exactly 1,650,763.73 wavelengths of a line in the atomic spectrum of the isotope. Radioactive krypton was used during the Cold War to estimate Soviet nuclear production by subtracting the amount of gas, that came from Western reactors from the total in the air. Biological role: It is considered to be a harmless gas, it could asphyxiate if it excluded oxygen from the lungs. Krypton is one of the rarest gases in the Earth’s atmosphere, it is present in the air to the extent of about 1 ppm (part per million). The atmosphere of Mars has been found to contain 0.3 ppm of krypton. It is extracted by distillation of air that has been cooled until it is a liquid. World wide krypton is produced around 10 tons each year.